Why verify the software quality? Why do you have in-house QA team or apply for independent testing services? Why are there so many providers of QA and testing services? Do you need software testing? First of all, the main aim of software testing is to HELP to improve the software quality by detecting any bugs that may affect user experience. Besides, quality verification helps to make sure all the requirements are met. Everything started on September 9, 1947, when Grace Murray Hopper recorded the first computer bug. Actually, it was a moth stuck in the computer. Nowadays, software issues can be of different types and severity levels. Such “moths in the computer” can cause huge financial losses as well as a failure of software product and company’s reputation. More about the most expensive bugs you can read in one of our previous articles. According to the data provided by the National Institute of Standards and Technology, a cost of software bug for US economy was $59.5 billion in 2002. The report conducted by Tricentis, a software testing company, informs that the worldwide cost of a software issue reached $1.1 trillion in 2016 and $1.7 trillion in 2017. Last year, glitches affected 3.6 billion users and caused downtime of 268 years. Ouch! Statista provided the analysis of the budget allocated to software testing and QA from 2012 up to 2018. In the period from 2012 to 2015, companies increased the budget on QA and testing. But in 2016 and 2017, the QA budget decreased. In 2019, it is expected that companies will allocate 40% of the project budget to software testing and QA activities. “Quality is Free”. That’s how Phil B. Crosby, an international quality consultant, named his book published in 1979. He developed a special formula that helped to count the cost of software quality. To get the cost of quality, you should add conformance and non-conformance costs. Conformance costs include prevention expenses, e.g., investments on QA, and appraisal costs, expenses on software testing. 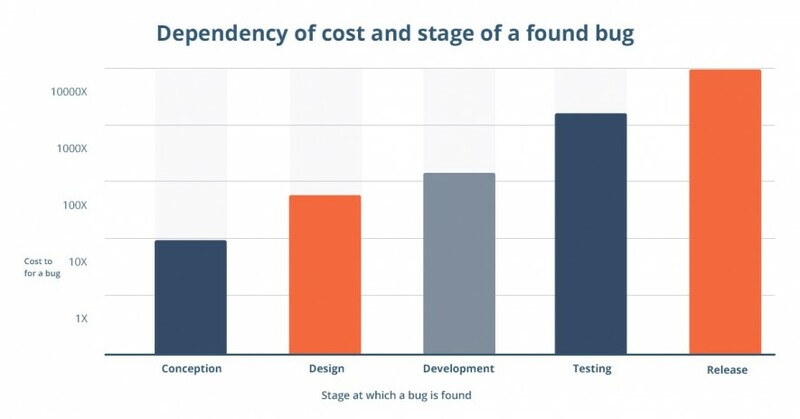 Non-conformance costs can be divided into the cost of internal failures, e.g., failed test cases, expenses on bug fixing, and external failures, for example, custom support. The earlier a bug is detected, the lower its cost will be. It is more effective to prevent software issues rather than to fix them. A bug detected after the release may cost 1000 times more as if it would be found at the design stage. So, are you sure that you don’t need software testing?